1 of 4 In a small bowl, stir together broth, 2 tablespoons of the curry paste, the fish sauce and brown sugar; set aside. 2 of 4 Sprinkle chicken with salt and pepper. 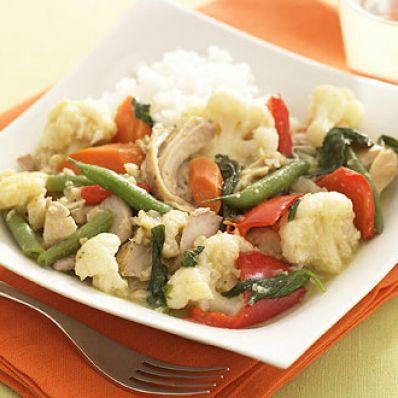 Place chicken in slow cooker with cauliflower and carrots. Pour curry mixture on top and cover. Cook on HIGH for 3 hours or on LOW for 5 hours or until internal temperature of chicken registers 160 degrees on an instant- read thermometer. 3 of 4 Add red pepper and green beans to slow cooker for last hour of cook time. 4 of 4 Heat coconut milk in a small saucepan over medium-high heat and whisk in remaining curry paste. Add coconut milk mixture and basil leaves to slow cooker for last 15 minutes of cook time. Serve with rice, if desired. Per Serving: 5 g fiber, 25 g Fat, total, 15 g carb., 30 g pro., 383 kcal cal., 14 g sat. fat, 129 mg chol.